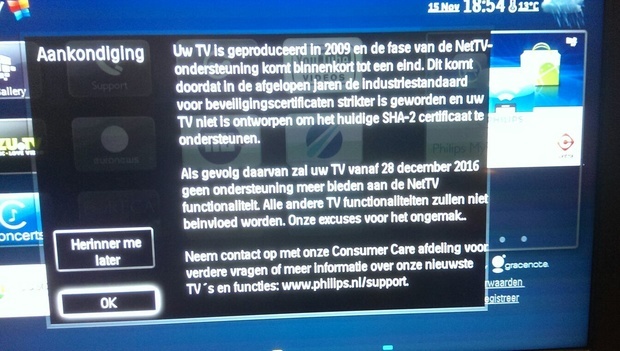 Philips smart TVs from 2009 will no longer be able to connect to the internet and therefore lose their smart functionality from the 28th of December this year. TVs from a year later do receive an update that allows them to get on the internet. The Dutch website Tweakers.net reports that 12 high-end models from 2009 are affected because they don’t support SHA-2 certificates. The 32-47 inch TVs from the 8000 and 9000 series only support encrypted connections using SHA-1 certificates and this encryption method is phased out by services like Netflix and Youtube. According to TP Vision, which manufacturers the TVs under a Philips license, it’s impossible to add SHA-2 support. It’s however unknown why the TVs wouldn’t technically be able to support SHA-2 so the NetTV feature, as Philips calls its smart TV functionality, can continue to work. Tweakers.net asked TP Vision and Philips for a reaction who responded that only a small number of TVs is affected but it’s unclear how many. The company advises affected customers to contact customer support but is unclear what they can offer. In the past Philips settled similar cases by providing affected customers with a Chromecast. Interesting is that Philips smart TVs from 2010 and later do get an update that adds SHA-2 support. Current Philips smart TVs run on Android TV and no longer on the NetTV platform. Update: Affected customers won’t be compensated because the changes are beyond control of Philips, according to a Tweet from Philips’ customer support.